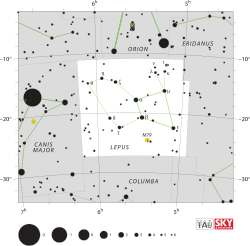 Beta Leporis (β Leporis, abbreviated Beta Lep, β Lep), also named Nihal, is the second brightest star in the constellation of Lepus. Nihal, β Lep, Beta Leporis, Beta Lep, 9 Leporis, 9 Lep, BD−20 1096, FK5 204, GC 6762, HD 36079, HIP 25606, HR 1829, PPM 248938, SAO 170457, WDS 05282-2046A. Beta Leporis is the star's Bayer designation. It is also known by the traditional named Nihal, Arabic for "quenching their thirst". The occasional spelling Nibal appears to be due to a misreading. In 2016, the International Astronomical Union organized a Working Group on Star Names (WGSN) to catalog and standardize proper names for stars. The WGSN's first bulletin of July 2016 included a table of the first two batches of names approved by the WGSN; which included Nihal for this star. In Chinese, 廁 (Cè), meaning Toilet, refers to an asterism consisting of β Leporis, α Leporis, γ Leporis and δ Leporis. Consequently, the Chinese name for β Leporis itself is 廁二 (Cè èr), "the Second Star of Toilet". Based on parallax measurements from the Hipparcos astrometry satellite, this star is located about 160 light-years (49 parsecs) from the Earth. It has an apparent visual magnitude of 2.84 and a stellar classification of G5 II. The mass of this star is 3.5 times the mass of the Sun and it is about 240 million years old, which is sufficient time for a star this massive to consume the hydrogen at its core and evolve away from the main sequence, becoming a G-type bright giant. ^ HR 1829, database entry, The Bright Star Catalogue, 5th Revised Ed. (Preliminary Version), D. Hoffleit and W. H. Warren, Jr., CDS ID V/50. Accessed on line November 18, 2008.